As electronic toys and gadgets have become increasingly miniaturized, their power requirements are being met by a new generation of compact, high-performance batteries. These disk batteries are small, pill- or coin-shaped devices that contain heavy metals such as zinc, mercury, silver, nickel, cadmium, and lithium. They also contain concentrated solutions of caustic electrolytes, usually potassium or sodium hydroxide. Their compact size and harmless appearance hide their true danger. 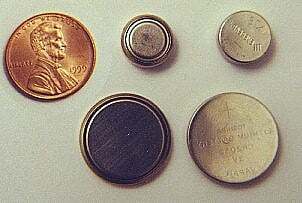 The danger comes when children (and sometimes adults) knowingly or mistakenly put these tiny batteries in their mouths and swallow them. Most swallowed batteries cause no problem. Batteries lodged in the esophagus (the food pipe between mouth and stomach) must be removed immediately. They cause damage by their pressure against the wall of the esophagus, from leakage of caustic alkali, and the electrical current they generate. Injury can occur in as short a time as one hour. Full-thickness burns can occur in four hours. Batteries passing through the esophagus usually pass uneventfully through the entire digestive tract. Call the National Button Battery Ingestion Hotline, (800) 498-8666, to be consulted for battery identification and emergency instructions. If instructed, take the person to the nearest Emergency Department for medical care. If you cannot find the battery that was ingested from the device, bring it to the Emergency Department. Do not give the person antacids or ipecac. Battery ingestion may not be obvious or symptomatic until harmful conditions develop. Thus, medical history and X-ray findings become exceedingly important for diagnosis. The person who has swallowed a disk battery may have one or more symptoms. Although mercury-containing cells tend to fragment, no clinical cases of mercury poisoning have been reported. Signs of mercury poisoning are lethargy, excitement, rash in the perineal/diaper region, or tremors. Radiographic studies of the entire digestive system may be taken. Disk batteries have a characteristic double-density (two-layer) shadow on X-rays. Laterally, their edges are rounded, and they contain a step-off junction at the positive and negative terminal. This can help distinguish them from coins and buttons. If a battery is located in the esophagus (food pipe), immediate removal is necessary. The most prudent home treatment for someone who has swallowed a disk battery is to give nothing by mouth and to go to the nearest hospital emergency department. If it will not delay going to the emergency department, bring a sample of the battery ingested. All disk batteries contain an imprinted code that can be used to identify manufacturer, the battery's actual size, and its contents. If no battery can be found, then bring the device from which the battery was removed. Call the National Button Battery Ingestion Hotline (800) 498-8666 may be consulted for battery identification and emergency instructions. Although antacids helped to prevent disk batteries from leaking in animal models, the dosage required in children would be too much. Avoid medicines like ipecac, which promote vomiting. Batteries that have safely passed into the stomach can be forced back into the esophagus. If the person develops symptoms such as abdominal pain or vomiting blood. Minor changes in stool color or minor vomiting are not indications for removal. Battery removal will likely be accomplished with an endoscope. 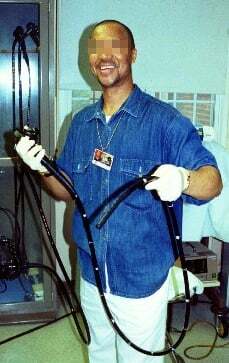 An endoscope is a flexible fiber optic scope with ports for grasping devices to be passed through it. This scope is passed through the mouth and into the esophagus and stomach. Endoscopy allows for battery removal and visual inspection of the esophagus for damage. If an endoscope is not available, removal by other means may be attempted. Transit time for disk batteries through the digestive tract ranges from 12 hours to 14 days. The majority of cells are passed in the stool within 72 hours. At home, strain stools for passage of the battery. Infrequent abdominal X-rays should be taken to confirm forward progression of the battery. If the battery contains mercury has fragmented (viewed by an X-ray), blood and urine mercury levels will be ordered. Medication to lower mercury levels should be used only when abnormal levels are found. For the majority of cases of disk battery ingestion, conservative therapy is all that is needed. The battery will pass on its own. A disk battery lodged in the esophagus is rare. Only two cases of 2382 studied had a major outcome. Both were young children with a large cell (20-23 mm) lodged in the esophagus. When a battery narrows or blocks the esophagus, severe bleeding or abnormal passages from the esophagus to other organs may occur. All can be aided by surgery, but outcomes can be severe. Heavy metal poisoning, while theoretically possible, has not been clinically reported. Batteries should be stored in childproof containers. In the majority of battery ingestion incidents involving children, the battery is found loose. Battery compartments on toys and gadgets should be properly secured and taped shut. One third of ingestion incidents in children occurred after the child removed batteries from a consumer product. Elderly people should never store disk batteries in pillboxes or set them out with medications. Their shape and size make them easily mistaken for medication. Several disk batteries with a penny for size reference. REFERENCE: Dire, DJ, MD, et al. Disk Battery Ingestion. Medscape. Updated: Dec 28, 2015. Please share your experience with your infant, toddler, or child's swallowed battery. Sharing your experience may help others. What symptoms did your infant, toddler, or child have from swallowing a battery? What first aid or emergency treatment did your infant, toddler, or child receive for battery ingestion? Did your infant, toddler, or child have complications from swallowing a battery? If so, what were they?